Droppin' historical knowledge on Washingtonians across the National Mall. In case you haven’t heard, Brian Unger has a new Travel Channel series called “Time Traveling with Brian Unger,” and for history buffs and non-history buffs alike, it’s pretty freakin’ sweet. 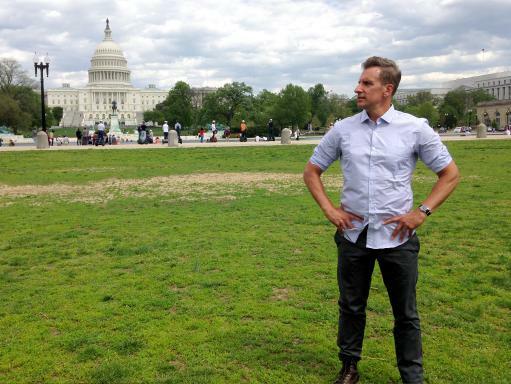 The season’s second episode, which airs Monday, April 27 at 10:00 p.m. ET/PT, is a two parter that starts in the District, as he takes Washingtonians on a tour of their own city — revealing parts of our nation’s capital they have yet to visit and droppin’ historical knowledge on them across the National Mall. Leading a group of five locals on a trip back in time, Unger relives the strange, but true history that created the U.S. Capitol, Washington Monument and Lincoln Memorial — before the Mall became the tourist trap (I mean, attraction), it is today. In the clip below, Unger describes the original plans for the Washington Monument, which resembled more of a triumphal colonnade than the obelisk that was actually constructed. Check out the clip, courtesy of Travel Channel, and be sure to catch the full episode on Monday.